Paul David Tripp's book, Parenting: 14 Gospel Principles That Can Radically Change Your Family, is a great reminder of our ultimate purpose as parents. Nothing is more important in your life than being one of God's tools to form a human soul. As a parent you're not dealing just with bad behavior, but a condition that causes bad behavior. It's very easy for me, as a parent, to get wrapped up in the here and now - the current behavior of my children and how that reflects on me - instead of on the long-term - how I want my children to be as adults when we reach the end of this phase of my parenting journey. This book was also a good reminder that my primary ministry right now is parenting my children. Nothing God has given me is more important than that. Not only was I given the opportunity to review Parenting: 14 Gospel Principles That Can Radically Change Your Family, but I also get to give away a copy of the book to one of my lucky readers. Just enter the giveaway below for your chance to win. Ballerina is in the 8th grade this year, and I spent most of the summer debating and praying about when I should have her begin her foreign language requirements for high school, what language I should have her study, and what curriculum I should have her use. I needed it to be something that took on a lot of the burden of teaching because I do not have enough background in any foreign language to be able to do the bulk of the teaching myself. When we began the school year, I still didn't have an answer. Thankfully we were given the opportunity to review High School Spanish I from Middlebury Interactive Languages, and it has completely answered my questions for Ballerina's high school foreign language requirements. I'm joining up at Five Minute Friday over at Heading Home. Each week she shares a prompt, and you write on that prompt for 5 minutes. This week's prompt is "park." When I first saw this week's prompt, I was stumped. What in the world would I write about? Then it hit me. Two weeks ago tomorrow, our town was hit hard by Hurricane Matthew. Since we're about 70 miles inland, I don't think anyone expected the high velocity winds that we experienced. Add those winds to the supersaturated ground that we're still experiencing from last year's "Thousand Year Flood" and you have many trees that just couldn't hold their ground any more. Our favorite park held one of those trees. This beautiful old oak tree sat at the side of the playground where my children used to play often when they were younger. 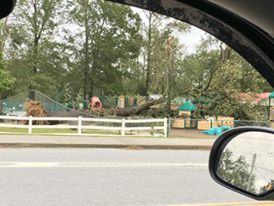 During Hurricane Matthew, this tree fell, damaging the fence and playground equipment. We pass by that park several times a week as I take my children to soccer practices, and it breaks my heart to see the park looking so bad right now. I know that eventually it will be fixed and back to "normal," but for right now, it's a sad sight. I'm joining up at Five Minute Friday at Heading Home. Each week, she shares a prompt, and you write on that prompt for 5 minutes. This week's prompt is "Mail." There used to be a time when I loved going out to check the mail. I'd see the mailman coming down the street, and I would get excited about what he would be putting in my mailbox that day. My mom and my grandmother would often send letters - actual letters! Sadly, I no longer have that excitement when the mailman has come and gone. My mailbox is usually full of junk mail and bills nowadays. My mom and my grandmother both passed away a few years ago. I've often thought about starting the tradition of letter writing back up with my own children, even though they still live in my house. It won't be long before they are all out on their own. If I set up a routine to write a letter, that personal touch of writing it in my own hand, maybe it will mean as much to them as the letters I used to receive from my own mom meant to me. Everyone now is so dependent on technology - emails, texts, etc. - to communicate that I wonder if we are losing the importance of hand-writing letters. Who would you love to get a handwritten letter from? Life at our house is never dull. Between soccer practices, cross country practices, and dance rehearsals, getting a good meal prepared for my family some nights is difficult (or even impossible). 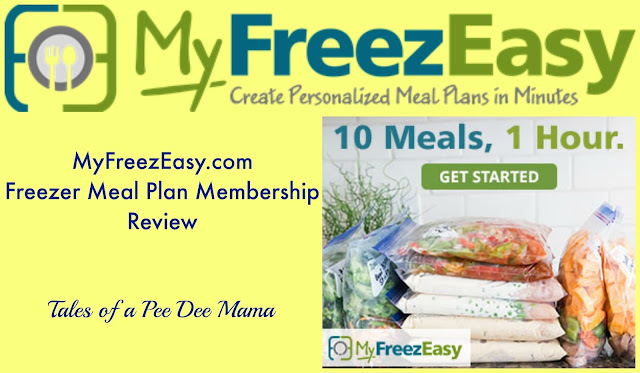 Using the MyFreezEasy.com Freezer Meal Plan Membership from MyFreezEasy has made freezer cooking so simple that I can get quality meals on the table even on our craziest days.